The Samyang 35mm f1.4 AS UMC with Sony A fit is a bright, wide-angle lens perfect for portraits, travel and reportage photography. This lens is specifically designed for cameras with a cropped APS-C sensor and provides an approximate focal length of 50mm (equivalent to 35mm format). UMC stands for Ultra Multi Coated, which indicates that the lens has been covered with multi-layered, anti-reflective coating which minimises reflections and increases image contrast. The Samyang 35mm f/1.4 has been designed with great care for the smallest details and perfect style. This applies both to optics and workmanship, which place the lens among the best photographic products available in the world today. 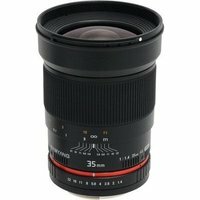 This lens is a manual focus lens and does not autofocus (AF).